Nowadays, there is an abundant supply of DDR4 memory modules with varying speeds and capacity. They also come in different colors, looks and design. Some have LEDs, some don’t, while others have plasma/lightning effects. Today we are going to take a look and review one of Crucial’s DDR4 memory kit geared towards any users who needs a stylish yet stable and reliable DDR4 memory kit – the Crucial Ballistix Sport LT Red DDR4-2400 32GB kit (8GBx4). 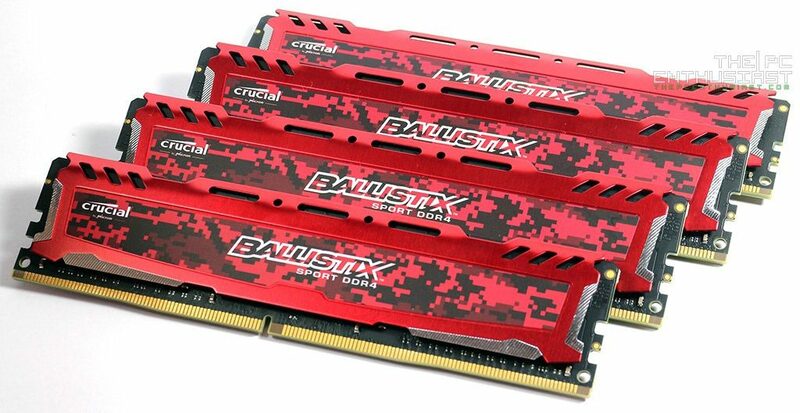 Crucial has previously released a grey and white version of the Ballistix Sport LT. As far as I know there is no difference between these memory kits except for the color of their heat spreader. The 8GB stick retails for around $30 at the time this review was posted. So how fast can the Crucial Ballistix Sport LT Red DDR4-2400 go? And can we squeeze out more speed from this kit? Please continue reading our Ballistix Sport LT Red DDR4-2400 review below. The Red version of the Crucial Ballistix Sport LT DDR4 memory is the latest addition to the company’s DDR4 memory lineup. It is basically similar with the Grey version (first Ballistix Sport LT DDR4) and the White version. The heat spreader design is basically the same, with the digital camo-themed heat spreader. Optimized for the latest Intel platforms (100 series and X99), the Crucial Ballistix Sport LT DDR4 features four channel memory architecture that maximizes data rates and speeds starting at 2400 MT/s. Obviously, this memory kit is faster and more responsive compared to the standard Crucial DDR4 memory. Like most memory modules, it supports Intel XMP 2.0 profile and comes with a limited lifetime warranty from the company. The Ballistix Sport LT lineup is designed for performance enthusiasts, gamers, and anyone who simply wants to get more out of their system. Compared to competition, the Ballistix Sport LT DDR4 lineup doesn’t seemed to have a (very) high XMP clock speeds. In fact most of Crucial’s DDR4 memories have a clock speed of around 2400MHz to 2666MHz only. However, this doesn’t mean that their memory kits are not good. 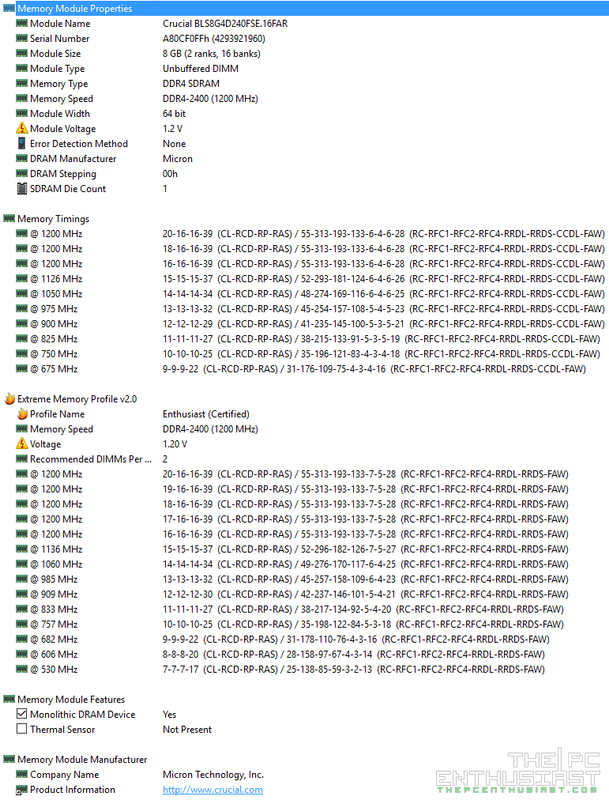 At these safe speeds, most (if not all) motherboards should be able to detect and validate them without any problem; and you should be able to set the XMP with ease. That’s actually one of the goals of Crucial’s memory. Crucial designed the Ballistix Sport LT DDR4 to be a plug and play memory with little to no tweaking at all. Of course if you want to overclock the memory, that’s another story and you really need to tweak the memory’s config including setting the voltage higher if necessary. Below is a screenshot of the SPD information of this memory kit taken from AIDA64’s report, and its specs sheet. After that, let’s proceed to the next page and take a closer look at the memory itself. Corsair Vengeance LPX DDR4 3000MHz Memory Review – Tested and Proven!